The best paying part-time jobs are typically hourly positions in a skilled field. Whether you want to start your own business on a part-time basis or you want the stability of working with an established company, there are a number of part-time job opportunities that pay very well. Massage therapists can work part-time for an established spa, or they can choose to develop their own clientele and work from home or a private facility. Massage therapists typically charge between $1.00 to $2.00 per minute of massage, resulting in a $60.00 to $120.00 per hour fee schedule. This sounds amazing, but keep in mind that massage therapists working for a company will only receive a portion of the total fee, typically between 40 to 60 percent of the cost of the massage. Even if you're performing massages independently, you'll need to set aside money from each massage for taxes, overhead costs and business supplies. Depending on your location and the going rate for massage, you can expect to take home between $20.00 and $80.00 per hour as a massage therapist. Like massage therapists, fitness instructors and personal trainers can choose to either work for an established fitness facility or they can build their own client base for home-training or a private fitness studio. Group fitness instructors working for a fitness facility can expect to make between $15.00 and $40.00 per class taught, and some fitness facilities offer bonuses based on the popularity of the class being taught. Breaking out on your own as a group fitness instructor can be difficult, but it's not impossible. If you want to teach independent classes, charging $4.00 to $6.00 per participant, per class is reasonable. A class of 20 participants could bring in roughly $100.00 per hour, but you'll have to pay your own overhead and taxes out of that amount. Personal trainers at major gyms can expect to make a commission on each personal training sale, typically between 40 to 60 percent of the training fee. Many gyms charge $50.00 to $100.00 per training hour, giving trainers the opportunity to make roughly $20.00 to $60.00 per training hour. If you want to build up a personal clientele, set a reasonable payscale of $30.00 to $100.00 per hour, depending on the going rate in your area, and plan to pay your taxes, overhead and supply costs out of your training rate. Students, teachers and professionals with a keen knowledge of a particular subject matter can make some extra cash by tutoring other students. Many school districts and private tutoring companies are looking for tutors for a set hourly rate ranging from $10.00 to $25.00 per hour. You can also advertise your services with universities, local newspapers and online classifieds like Craigslist, setting your own hourly rate based on the subject matter. For instance, if you want to tutor younger children in a general subject like writing, basic math or science, you're probably going to be competing with more tutors and you'll want to set a lower hourly rate. On the other hand, if your subject matter is highly specialized, like organic chemistry or Shakespearean literature, you can probably feel confident increasing your hourly rate to the upper end of the hourly payscale. If you're handy with computer hardware and software and can troubleshoot almost any computer problem, consider picking up a gig with a computer repair service or start to advertise your services independently. As the world becomes more focused on technology, more and more people are needed to fix the problems that arise with electronic equipment. According to payscale, computer repair technicians typically make between $10.00 to $16.00 per hour, but if you're working on your own, you should feel comfortable setting a slightly higher hourly rate. If you're prompt, customer-service oriented and good at what you do, you'll be surprised at how quickly your business can grow based on word of mouth. People are willing to pay for fast and friendly service when it comes to getting their computers fixed. 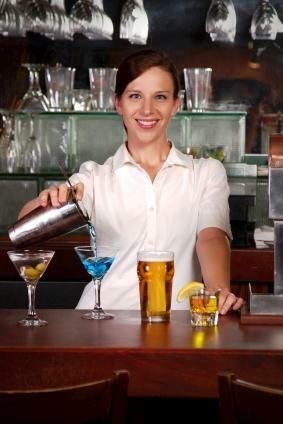 While not all bartenders or waiters make good money, those who land gigs working at a high-end restaurants or bars can start pulling in between $100.00 to $200.00 dollars per night in tips. If you're working at smaller restaurants and bars, $30.00 to $60.00 in tips is probably a more reasonable guess. Add those amounts to the going hourly rate for waiters and bartenders, and you're looking at an average of $10.00 or more per hour. Keep in mind that tips don't just magically appear - you do have to work for them. Friendly, prompt and quiet service earns high marks and big tips. In addition to the jobs listed above, some of the best paying part-time jobs are in the healthcare field. Many nursing and healthcare technician positions are offered on a part-time basis and pay at a rate competitive within the field. Also keep in mind that some of the best part-time jobs simply involve moonlighting within your chosen career field. For instance, if you're a business manager, start looking for management consulting gigs. FlexJobs is a great resource to find professional part-time jobs. If you're a journalist, start looking for freelance writing gigs. These types of part-time jobs work well because you can add them to your schedule as time allows without committing yourself long-term.